Will there be a Credo of the People of God at the climax of the Year of Faith indicted by Benedict XVI as there was during the year of faith indicted by Paul VI? - (And some believes there will also be a Papal encyclical on Faith). The Year of Faith indected by Benedict XVI is maybe the most important step of the path of purification and renewal of the Faith brought on by the Pope since the beginning of His pontificate. The “word orders” are: turning back to God, turning back to the Faith, turning back to the search for God. And doing it with the weapons of the Reason. This Benedict XVI particularly underlined during his trip to Germany. He praised the providentiality of secularizing trends. More: he said that «agnostics, who are constantly exercised by the question of God, those who long for a pure heart but suffer on account of our sin, are closer to the Kingdom of God than believers whose life of faith is ‘routine’ and who regard the Church merely as an institution, without letting their hearts be touched by faith». Words that he reprised in Assisi. This was a central topic for Pope Paul VI, who indicted a Year of Faith in 1968, and he concluded it in Saint Peter’s Square, on June 30, 1968, with the proclamation of a solemn profession of faith, the Credo of the People of God. How, and why, did Paul VI get the idea to coronate the Year of Faith with the proclamation of the Credo of the People of God? The answer to these two questions is in the sixth volume of the Correspondence between the Swiss theologian and cardinal Charles Journet and the French philosopher Jacques Maritain, the 303 letters that the two exchanged between 1965 and 1973. It was Maritain who wrote the outline of the Credo of the People of God that Paul VI later recited. Maritain was 85 years old in 1967, and he had just published Le paysan de la Garonne [The peasant of the Garonne], a criticism of the post-conciliar Church «on its knees before the world». In a letter, he confides to cardinal Journet an idea: «The Sovereign Pontiff should draft a complete and detailed profession of faith, in which everything that is really contained in the Symbol of Nicea would be presented explicitly. This will be, in the history of the Church, the profession of faith of Paul VI». Journet photocopied the philosopher’s letter and gave it to the pope, when he met with him on January 18. On that occasion, Paul VI asked the theologian for his judgment on the state of the Church’s health. «Tragic», Journet answered. Both he and the pope were in shock over the publication in Holland – one year earlier and with the blessing of the bishops – of a new Catechism aimed at nothing less than «substituting one orthodoxy for another in the Church, a modern orthodoxy for the traditional orthodoxy». On December 14, Paul VI again met with Cardinal Journet, who told him about Maritain’s idea. And Paul VI reminded him that others had already suggested, at the end of Vatican Council II, the promulgation of a new symbol of faith. Paul VI said to Journet: «You two, prepare for me an outline of what you think should be done». It emerges from the correspondence between the theologian and the philosopher that Maritain intended his text to be simply a guide. But Journet decided to send the text to the pope without adding anything. On April 6, a letter arrived from Rome from the Dominican theologian Benoît Duroux, an adviser for the congregation for the doctrine of the faith. It praised Maritain’s text and supplied a few comments. On June 30, 1968, Paul VI solemnly proclaimed the Credo of the People of God in Saint Peter’s Square. There are few variations compared to the Maritain’s sketch: in one passage, Maritain had explicitly cited the common witness that the Israelites and Muslims give to the one God, together with Christians; in his Credo, Paul VI gives thanks to the divine goodness for the “many believers” who share faith in the one God with Christians, without specifically mentioning Judaism and Islam. There is much of Paul VI in Benedict XVI. When he still was a cardinal, Joseph Ratzinger commemorated Pope Montini remembering that «the Pope considered that it was his commitment to defend and put under light the entity of the faith instead of dissolving the message in a simple repetition of ideologies that come and go. In the midst of the confusion of the dictatorships, faith gave a good account of itself for its capacity not to be corrupted: one must obey to God more than to the men. If many classified Pope Montini’s pontificate as contradictory, as part of the unsolved dialectic between breakthrough and tradition; they so neglect what characterizes the most the pontificate, the interior unity of his action that comes from the immutability and dynamism of the love to Christ». It is worth to give a look to the worries of Paul VI, the menaces against faith he saw. June, 29th 1972, homily for the Feast of Saint Peter and Paul: «From some fissure the smoke of Satan has entered the temple of God. There is doubt, incertitude, problematic, disquiet, dissatisfaction, confrontation. There is no longer trust of the Church; they trust the first profane prophet who speaks in some journal or some social movement, and they run after him and ask him if he has the formula of true life. And we are not alert to the fact that we are already the owners and masters of the formula of true life. Doubt has entered our consciences, and it entered by windows that should have been open to the light.» November, 15th 1972, general audience: «One of the Church’s greatest needs is to be defended against the evil we call the Devil […] It is a terrible reality, mysterious and frightening. […] It is a departure from the picture provided by biblical Church teaching to refuse to knowledge the Devil’s existence […]So we know that this dark disturbing being exists and that he is still at work with his treacherous cunning; he is the hidden enemy who sows errors and misfortunes in human history». February, 3rd 1977, general audience: «Is not it a wonder if the Scripture harshly admonish us that “all the world underlie the power of the Devil?”». 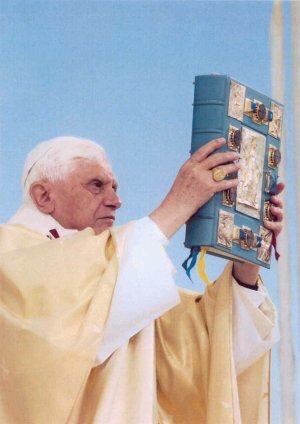 The answer is in quaerere Deum, the search for God that Benedict XVI exalted in the speech he held at the College des Bernardins in Paris in 2008. The Pope said: «Because [the monks] were Christians, this was not an expedition into a trackless wilderness, a search leading them into total darkness. God himself had provided signposts, indeed he had marked out a path which was theirs to find and to follow. This path was his word, which had been disclosed to men in the books of the sacred Scriptures. Thus, by inner necessity, the search for God demands a culture of the word or – as Jean Leclercq put it: eschatology and grammar are intimately connected with one another in Western monasticism. The longing for God, the désir de Dieu, includes amour des lettres, love of the word, exploration of all its dimensions». The scripture is the signpost we should refer to. Let’s make a step backward, to the Pope’s Regensburg address in 2006. «While we rejoice in the new possibilities open to humanity – the Pope said – we also see the dangers arising from these possibilities and we must ask ourselves how we can overcome them. We will succeed in doing so only if reason and faith come together in a new way, if we overcome the self-imposed limitation of reason to the empirically falsifiable, and if we once more disclose its vast horizons. In this sense theology rightly belongs in the university and within the wide-ranging dialogue of sciences, not merely as a historical discipline and one of the human sciences, but precisely as theology, as inquiry into the rationality of faith». Let’s make a step forward, and re-read the speech Benedict XVI addressed in 2010 at Westminster Hall to the representatives of British Society. «The inadequacy of pragmatic, short-term solutions to complex social and ethical problems has been illustrated all too clearly by the recent global financial crisis. There is widespread agreement that the lack of a solid ethical foundation for economic activity has contributed to the grave difficulties now being experienced by millions of people throughout the world. Just as “every economic decision has a moral consequence” (Caritas in Veritate, 37), so too in the political field, the ethical dimension of policy has far-reaching consequences that no government can afford to ignore». 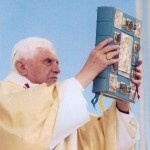 During his pontificate, Benedict XVI worked to alight one by one all the objections moved to the faith. In his speeches, he puts the history of world under a new light, by facing the main moments of modernity (the Protestant reform, the Enlightenment, the 20th century’s ideologies) and analyzing them. Each moment has a part that one can share – the reaction to rationalism of the Renaissance for Luther, the critic to fideism and the re-evaluation of the Reason for the Enlightenment, the wish to face the problems and injustices caused by social and political inheritance of the Enlightenment for the 20th century’s ideology – and a part that in some ways denies what good has been done: Luther dismantles the synthesis of faith and reason that gave life to Medieval Christianity; Enlightenment – in order to re-evaluate reason – it radically divides the reason from the Faith, it become laicism and it compromise the integrity of the reason it wanted to save; the 20th century’s ideologies – by criticizing the abstract idea of freedom of the Enlightenment – put in discussion freedom itself. «First collect the weeds and tie them in bundles to be burned; then gather the wheat and bring it into my barn». (Matthew, 13-29) It is in the words of the parable of the weeds that one can recognize the modus operandi of Benedict XVI. He did so even when he was Prefect of the Congregation for the Doctrine of the Faith (one example: the two documents on the Theology of Liberation, the first one pars destruens and the second one pars construens). Benedict XVI is conscious that the Church is living a dramatic era, under the dictatorship of the false Gods, living the prophecy of Fatima. Fatima has had an important role in the Catholic Church ever since the Virgin Mary appeared to three poor shepherd children here in 1917. The children said she spoke to them and entrusted them with three prophetic revelations known as the three secrets of Fatima. The first two secrets were made public early on. But the mysterious “third secret” was not revealed until 2000, when it was interpreted to be a prediction of the attempted assassination of Pope John Paul II in 1981. Pope Benedict, in a conversation with reporters, explained in his precise Italian that the interpretation of the third secret does not stop there, however. The third secret – he said – has a permanent and ongoing significance. The Pope said its significance could even be extended to include the suffering the Church is going through today as a result of the recent reports of sexual abuse involving the clergy. «As for the new things which we can find in this message today – the Pope said – there is also the fact that attacks on the Pope and the Church come not only from without, but the sufferings of the Church come precisely from within the Church, from the sin existing within the Church. This too is something that we have always known, but today we are seeing it in a really terrifying way: that the greatest persecution of the Church comes not from her enemies without, but arises from sin within the Church, and that the Church thus has a deep need to relearn penance, to accept purification, to learn forgiveness on the one hand, but also the need for justice. Forgiveness does not replace justice. In a word, we need to relearn precisely this essential: conversion, prayer, penance and the theological virtues». In Fatima, Benedict XVI put the Church in penance. The year of Faith will probably be the last step of purification, waiting for a new evangelization of the world, as the Pope wrote in Porta Fidei: «It often happens that Christians are more concerned for the social, cultural and political consequences of their commitment, continuing to think of the faith as a self-evident presupposition for life in society. In reality, not only can this presupposition no longer be taken for granted, but it is often openly denied». The need is to turn back to the Credo, because «confessing with the lips indicates in turn that faith implies public testimony and commitment. A Christian may never think of belief as a private act. Faith is choosing to stand with the Lord so as to live with him. This “standing with him” points towards an understanding of the reasons for believing. Faith, precisely because it is a free act, also demands social responsibility for what one believes». slowly by hand so that it retains top quality.